Another Saturday rolls round not a moment too soon, and Kruger too, which isn’t necessarily a bad thing either. This week we’ve got a mixture of definitions containing a letter mixture of the answer plus a superfluous letter. Normalish clues too, wordplay also yielding an extra letter. Put them together and what do we have? A description of somebody 18d by 1d who we have to remove from the grid. Sounds nasty. I bet though Kruger didn’t have to contend with a multitude of colds and chest infections when he was setting this. And being suitably cold for the time of year there’s nowhere to hide. I am doomed. And struggling. Because – which clue is which type? For a long time I didn’t have anything other than EVADERS and ANNALS. Nothing at all – apart from a creeping sense of despair that is. 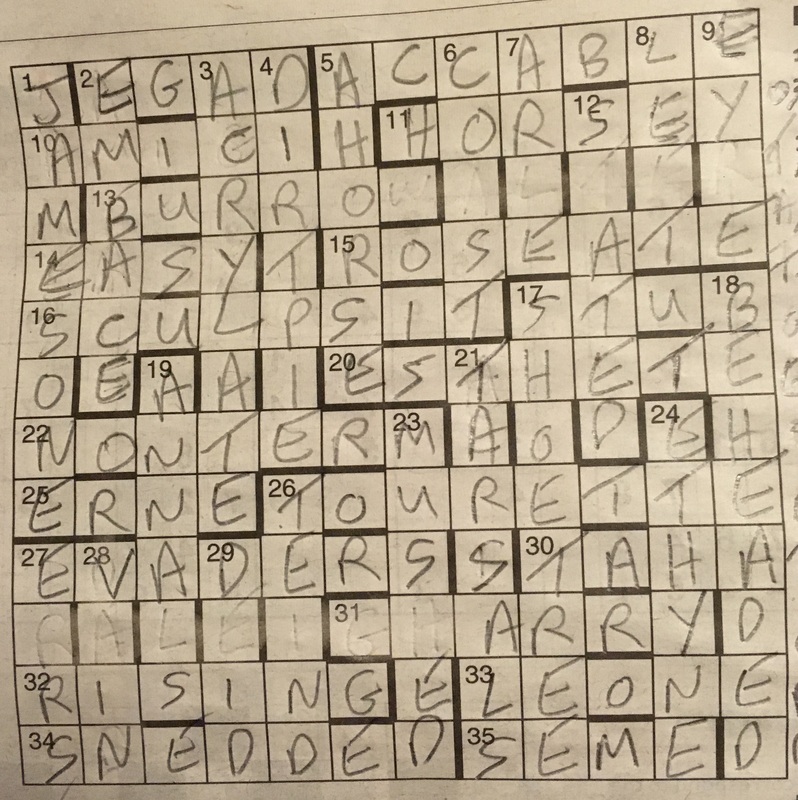 Filled in a couple of normal sort of clues in that bit of the grid. Struggled a bit longer. Had the spiffing idea that 18d might well be BEHEADED, and then came to a great big grinding halt with only half filled. Eight o clock (night time, I’ll have you know, still BST) passed without further progress. And ten o clock. Though around then I did spot TO BRITAIN as the last bit of the extra / superfluous letters. It would be at precisely 10:50 PM that I thought, hang about, we’re looking for somebody in the grid, I wonder if that will help? Couldn’t find them. Did though find some bits in the extra letters that looked like they could be TOBACCO. Had a rare moment of inspiration and spotted RALEIGH down to the SW. Bingo. How, I hear you ask, did that help in the, until now, mostly blank top half of the grid? Well, we’re evidently looking for WALTER. Could “Warren” at 13ac be BURROW? Yes, it could. Pencil in Mr Raleigh’s first name giving some handy checking letters, polish off the rest of the clues. Swiftly erase Walter from the grid. The extra letters? HE BROUGHT TOBACCO AND POTATOES INTO BRITAIN. Though the IN bit I must admit is a bit of a shot in the dark. One last question, then. He was 18d by who? Nobody seems to know who the executioner was a pretty thorough trawl through Google reveals. A long, long time later… Yep, JAMES ONE, or James 1st as he’s more commonly known. And there we have it. Done. Another decidedly tricky one I thought. Is it just me, or have we had a run of particularly difficult puzzles? Or am I losing my touch? Which is possible. More than possible. So to bed, and an extra hour, it being in theory the best night’s sleep of the year. Guess how that went. According to the pros over on Fifteensquared there was a little jiggery-pokery going on with the wordplay of BURROW, which led to BURRO. Walter beheaded. Not that I noticed. And it made scant difference once Raleigh had been removed from the scene. An odd one.